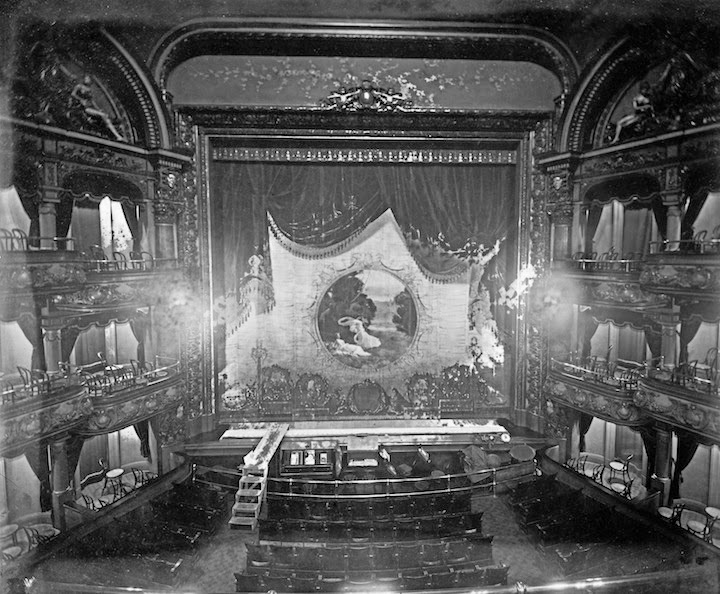 Houdini opened for a week at the Gayety Theater in Washington D.C. Feb 12, 1912. He would play the Gayety until Saturday Feb 17th. 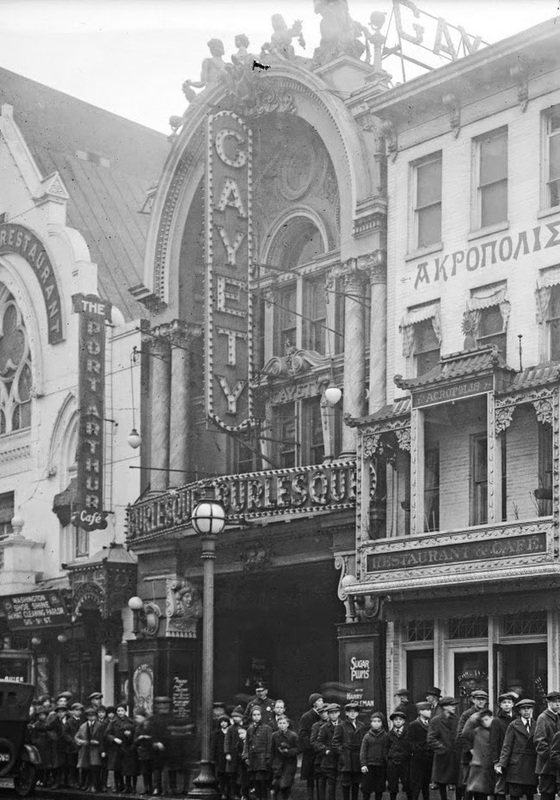 The Gayety Theater was located on 513 9th St. NW Washington, D.C. The Gayety opened in 1907 on the street known for it's theaters and nightlife. According to an ad in the Washington Times on Feb 12, "Houdini-the Handcuff King, Who will perform astounding feats with locks, straitjackets, and handcuffs at every performance. The Original HOUDINI." 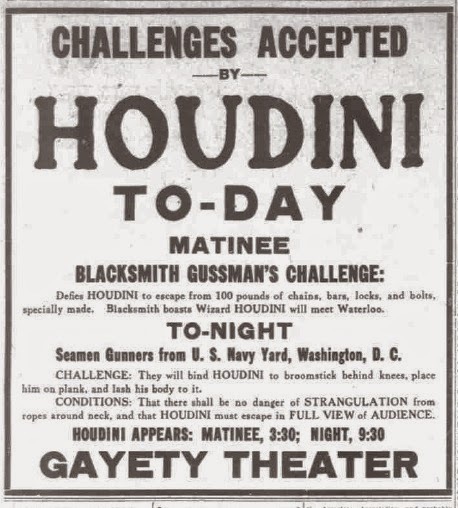 The ad also mentioned that Houdini would perform twice a day, a matinee in the afternoon and then again in the evening. Through newspaper records I've been able to track Houdini's performances for the week. It would appear that his opening on Monday Feb 12, he presented a number of feats and then let the audience know of the first 'challenge' for the week. This would take place on Tuesday evening Feb 13th. I will print exactly what it says in the newspaper ad. "HOUDINI-the Handcuff King Has just been challenged to escape from an airtight galvanized iron tank into which he will be locked by the Jos. Schlitz Brewing Co., after they have filled it with beer. Tuesday Night"
So here is 'Challenge 1' and it's obvious that this one was orchestrated by Houdini. The 'airtight galvanized iron tank' is Houdini's Milk Can escape, but filled with beer rather than the usual water. And instead of hauling it out as his original invention, it's presented as a challenge from the Brewery. On Feb 14th, Houdini is again challenged. Here is how reads the ad for the Gayety Theater promoting this escape. "HOUDINI the Handcuff King, HOUDINI has been challenged by the Beacon Shoe Company. They will search him, rope him and nail him in a box they have built and out of which they wager he cannot escape." Things get really interesting on Thursday Feb 15th. The Gayety takes out a larger ad, this time promoting ONLY Houdini. In addition, small articles on Houdini appear in two different newspapers. One of those articles is promoting his challenge for that evening. The other article is quite telling. The headline for this article reads "Houdini Does Magic For Newspaper Men". This time, rather than go to the newspapers office, he went to the National Press Club. He presented some card manipulations and tricks with cards and then finished with his famous Needle trick. Houdini must have given this exhibition for the Press Club sometime in the afternoon. The National Press Club is only a couple blocks from where the Gayety Theater was located. On Feb 15th, Houdini actually presented not one but two challenges. The afternoon challenge is by the Blacksmith Gussmans. The evening challenge is by the Seaman Gunners from the U.S. Navy Yard which again, is not too far from the theater. You can see that ad to the left. On Friday Feb 16th, Houdini again gets a small article featuring his upcoming escape for that evening. In addition the two big papers in town both print ads similar to the one above featuring the details of that days challenges. In the afternoon, Houdini accepts the challenge made by a group of Sailmakers. They will tie his hands and feet behind his back with ropes soaked in rosin and tar, then place him in two of their specially made burlap bags. One to be fastened over head and the other tied at feet. The evening challenge carries the headline "The Supreme Test of His Career-TONIGHT". The rest of the ad reads, " Insane asylum attendants will roll him in soaked wet sheets in mummy fashion, securely tie him down with broad bandages to a hospital bed, pour 20 buckets of water over him to shrink the knots, and he will attempt to release himself in FULL VIEW OF THE AUDIENCE". Saturday Feb 17th is Houdini's final day at the Gayety in Washington D.C.. He gets yet another small article in the paper featuring his challenges. The article begins by saying that Houdini has been breaking all records at the Gayety this week. The two big papers again feature very large ads promoting the final challenges for the week. The matinee challenge will be from 'Spanish Inquisition Irons from war museums.'. And the final evening challenge of the week might sound familiar to some of you folks who know Houdini. The final challenge reads "Mechanic's Automobile Challenge - They will bind and lock Houdini in two inflated tires. They guarantee not to choke him in locking his head to the tires." This is a duplication of the Weed Tire Challenge that he first performed in 1908. There you go, a week in the career of Harry Houdini Feb 12-17, 1912 Washington D.C. The information for this article was gathered from the Washington Times Newspaper and The Washington Herald Newspaper from 1912. Wow Dean! A fantastic post! After reading this, one begins to realize the extent of Houdini's grueling schedule. He wrote in his one of his diaries around this time that he had to find a way to reduce his labors. The work was killing him.